Mix the flour, salt, and butter in a large bowl. Knead until everything is well mixed. Add 1-3 tablespoons of water, depending on how dry the dough is, continue kneading until the dough is even in consistency and doesn’t stick to your hands. Form a ball with the dough, cover in plastic wrap and refrigerate for 30 minutes. In the mean time, cut the bread into very small pieces. Mix 1/4 cup of yogurt with 1/2 cup of water and soak the bread in this mixture. When the dough is ready, heat the oil in a saucepan over medium, heat and sauté the onion for 3 minutes, constantly stirring. Strain the bread and squeezing out all the excess liquid. Put the bread, artichokes, half of cup of cheese, eggs, 1/2 cup of yogurt, salt, pepper and sautéed onion in the blender. Blend until the mixture is uniform and creamy. Grease and flour 7 muffin molds. Cut the dough into 7 pieces and knead each one over a floured surface until you are left with a thin dough. Put one piece of dough into each muffin mold and apply pressure with your fingers to cover the entire surface of the mold. Cut the borders that come out from the mold with a knife. Make a ball with the left over dough and freeze until the next time you need dough. 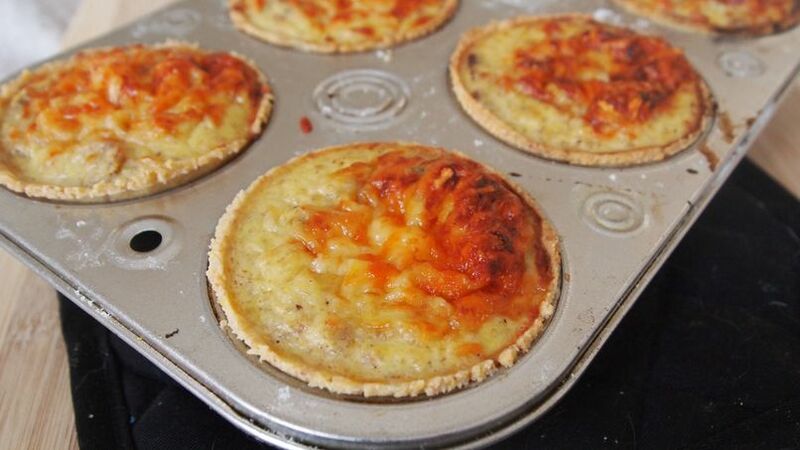 Fill each muffin mold with the artichoke cream and sprinkle with a bit of cheese. Bake for 30 minutes and then broil for 2. Wait until the flans are almost cold to carefully remove from the mold with the help of a knife. This recipe can also be made with out the dough base. To do this, it would be ideal to use silicone muffin molds and it wouldn't be necessary to grease and flour them. You can use quinoa instead of bread and if you leave the dough out of the mix, these little flans can be entirely gluten free. It’s no secret that Latinos absolutely love flan. I even have a friend who makes different a different kind of flan every Friday. You can only imagine the amount of delicious combinations she’s come across over time! I don’t really know how or when this French pastry took root in our culture, but there’s no doubt that it’s made a place for itself in all of our countries. We often forget that flan originally came from France and was not invented by our ancestors. In Peru, like in many places, the passion for flan has not limited itself to the realm of sweet pastries, but has transcended to that of the savory as well. One of the most popular in Peru is the artichoke flan, as we are very big fans of this veggie. My recipe for mini flans made in muffin molds is the perfect snack for a party, brunch, BBQ or any other occasion! I made them with a dough foundation so they would be easier to eat while served on a napkin. Make tons because I know they will disappear in just a few minutes!